New York City Landlord and Tenant Laws is a concise, accurate, and up-to-date resource for those interested in understanding New York City's landlord and tenant laws. 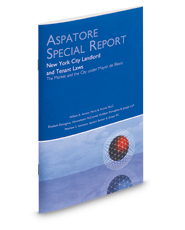 Written by experienced New York real estate attorneys, this special report describes issues that arise from neighborhood gentrification, guides the reader through the laws surrounding New York City's short-term rental world and explains lease issues in the city's commercial real estate market. The different niches represented and the breadth of perspectives presented enable readers to get inside some of the great legal minds of today, as these lawyers offer up their thoughts on the keys to success within this dynamic legal field.